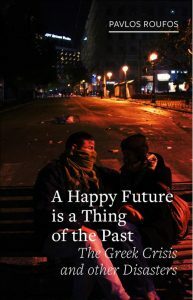 The mordant title of this book encapsulates the outcome of the collapse of the Greek economy, and the ultimate defeat of the popular protests against the austerity drive forced through by successive governments and driven by the international institutions of the IMF (International Monetary Fund) and the ECB (European Central Bank). It begins with an account of the development of the Greek economy, unpicking the ideological image created during the crisis of a corrupt state where no-one pays taxes and the government lies to fund a generous welfare state at the expense of industrious North Europeans. It traces the history of the Greek economy back to the ruins of World War II. By Roufos’s account, the Greek state had collapsed after its collaboration with the Nazi occupation. This led to a civil war which lasted until 1949, with a right-wing victory supported militarily and financially by the British state. This left a repressive regime, intent on suppressing the left, in charge of reconstruction funds from the US. The key point is that this repression led to a large informal economy, where people relied on family structures to off-set wages that were being held down. ‘Wages were seen as a cost, and not an investment,’ Roufos notes, and a fully developed labour market did not emerge. This repression eventually led to the dictatorship of the Greek Colonels, as workers began to resist their poverty. The Greek economy continued to be a low wage economy, dominated by exports. For this reason, Greece was keen to join the European Union at its inception. Greece was thus caught up in the tides of the world economy, battered by storms such as the end of the Bretton Woods agreement. Particularly, Roufos notes that private capital often had little incentive to invest in developing Greek industry. Further, he notes that the German economy had a vested interest in drawing Greece and Italy into the Euro to prevent competitive devaluations. The culmination of this was that Greece tended to be dependent on EU development funds, and cheap credit. Politicians mediating the needs of capital responded by holding down wages and cutting corporate taxes whilst also reducing controls on borrowing and financial movements. The seeds of the narrative of Greeks ‘living beyond their means’ (a statistically disprovable lie) were sown at this time. When the Great Crash of 2008 came, Greece bore the brunt, and its over-extended banks went bankrupt, threatening the investments of German and French banks. Greece’s economy went into freefall, and the Government was required by the rules of the EU and the European Central Bank to take drastic measures to rein in its budgets: the narrative of the bloated public sector workers’ salaries and pensions was trumpeted to aid this cause. Roufos notes how this was also used as an opportunity to further liberalise the Greek economy. Swingeing public spending cuts were put in place, leading to widespread protests and general strikes – most famously at Syntagma Square where the Greek arm of the Occupy movement fought running battles with riot police who knew only violence as a way to preserve the dominant order. Roufos discusses how the Syntagma movement sought to remain a leaderless open movement, refusing interference by organised leftists (even banning flags from the square). He also notes, however, the devolution of the movement into a series of monologues as the voices in the square talked on and on. The only positive he sees, indeed, is in the violence against the police, as the formal movement turned into practical opposition to state attempts to crush it. The text discusses how the organised left and unions seek and fail to mediate the conflict between workers and capitalists. This is an important point: the fall in living standards experienced in Greece is dramatic, and anyone who has ever expected a crisis to turn into a revolution would surely expect this level of collapse to lead to revolution. Instead there is a series of disappointments. Disappointment in existing state institutions. Disappointment in protest. Disappointment in strikes, and ultimately, the disappointment of the radical election of Syriza, the leftist party now in power. As Roufos notes, each disappointment contributes to the sense that there is no alternative. Syriza came to power promising to mitigate and reverse austerity (as the author notes, the small print was if their debt restructuring demands were accepted by the IMF/ECB). Yanis Varoufakis is criticised for taking the logic of the academic seminar room into the world of international power politics, and expecting a rational response. The end result of Syriza’s attempt to negotiate, despite the Greek population’s resounding ‘Ochi’, was the final hammer blow to any resistance. Syriza became a party of austerity and capitalist orthodoxy, eventually to be praised for guiding Greece through internal devaluation and out of special measures. Finally, the book ends on a dismal note: there was no emergence of a sense of international working class solidarity. Indeed, the dominant leftist response is similar to the national restructuring of that of the Corbyn movement, retrenching behind national barriers. Greece has been left where it was in the world economy, after over a decade of suffering. This tract is worth reading and digesting because the Greek lesson must be learnt.